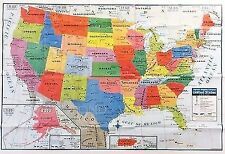 USA United States Map Poster Size Wall Decoration Large Map of USA 40" x 28"
Magnetic puzzle map. Missing Washington DC and New Jersey. Texas has a minor bent to it. The map folds. Magnets are strong. Solid educational puzzle. Highlights Top Secret Adventures. Puzzle, new in the bag. Seal was not broken. New puzzle book. It's never been written in. Are you looking for more than one set for your Child?. or for a gift to another Child?. Notepads Extra Large Children’s Elementary School. 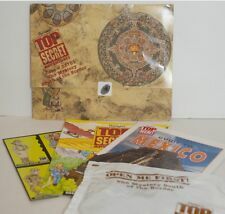 GEOSAFARI THEATRE Interactive Teaching Game & 7 Lesson Packs 1995 MINT! GeoSafari Theatre main unit. Instruction manual. Tested and works. Two hand held remotes (require AA batteries - not included). No signs of use or wear. The direction card states "There are 48 full color cards included. 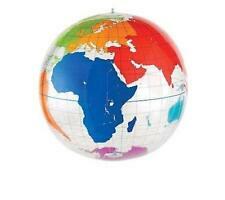 (6 continents and 41 important countries." ). However one of the country cards is missing. they are printed on thin cardboard type paper and are very sturdy. 100 Cards (These United States). Therefore there are labels on boxes. These are believed to be complete sets. They show normal signs of wear and tear, normal from use. 1 score card and instructions. By Child Light. NO smoking in our house, but we do have a cat. She mostly lives outside, but if allergies are a problem for you, then just know there is a cat in the house. Book ( with instruction for building the cardboard house ). Imagine bringing a dinosaur back to life. Now you can with the 36" Edu-Toy Tyrannosaurus Rex Skeleton. After snapping all 51 pieces together, you can begin to imagine the enormity of this 20 foot tall creature whose body spanned 40 feet. Here is how it works. It is an exciting race that combines strategy with luck, in cooperation with good-natured competition. The simplicity of play makes Take Off! the ideal introduction to basic location geography for young children, yet it is interesting and challenging for the whole family. 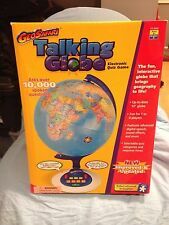 For sale is this Hammond Globes in a Box educational toy. Ticket to Ride Express: New York City 1960 Board Game - NEW! SEALED! Ticket to Ride New York Days Of Wonder Alan R. Moon Fast game Of Exploration Of 1960’s New York. 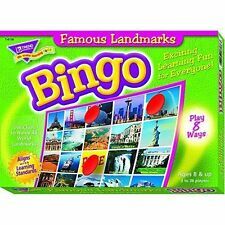 For 2-4 Players, Ages 8 New game In Shrink-wrap! The majority of our books are used. There may be other wear consistent with being. owned and shows wear due to its age, use. stains, foxing, scratches, scuff marks to cover and pages. Includes an [optional] map, though, the map I've included is not the original map. 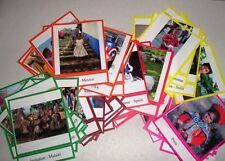 100 Cards (Presidents and Politics). 1 score card and instructions. Therefore there are labels on boxes. These are complete sets. They show normal signs of wear and tear, normal from use. The Seven Continents of the World Jigsaw Book -- With Six 48-Piece Jigsaws. I do not think the jigsaw puzzles have ever been taken apart/put back together. 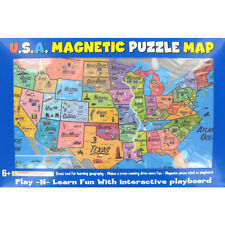 Find your place in the world with this educational jigsaw book. Used in the 1960's - 1970's as an educational tool / World Explorer Program. Each kit contained a Country Artifact, a record of the sounds of the country 33-1/3 RPM record (floppy plastic) a map and an informational booklet. Everything else included. 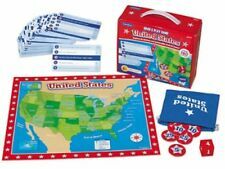 A great way for kids to learn about geography (continents, countries, and capitals). Put the World in your Hands-Great Learning Tool. Cards are all there - Box has very light shelf wear. Knowing and using various text features to locate key facts or information in a text. -Identifying the main topic of a multiparagraph text and the focus of specfic paragraphs within it.
" Prehistoric Life Toob". The Prehistoric Life TOOB® is part of the TOOBS® collection. This set features mostly shades of brown with splashes of orange red for the fire and lava, and green for the pine tree. In good condition missing 2 explore cards and directions. Highlights Top Secret Adventures. Are you looking for more than one set for your Child?. or for a gift to another Child?. Nothing has been touched, played with or opened. I wanted you to see detailed images of the complete set. Case #11347. Puzzle, new in the bag. Seal was not broken. New puzzle book. It's never been written in. Highlights Top Secret Advetures. Lot of Safari LTD 6 Figures & 2 Horses Knights Medieval. Condition is Used. Shipped with USPS First Class Package. Actual item received may vary sligh tly from the one pictured. This item is New (unopened) in the box. Box is in very good condition. A really cool item for children. Ages 5 and up.